Scuba Center | About Us | Proud to be a SAM ( formerly CCR ) registered supplier for the United States Government. 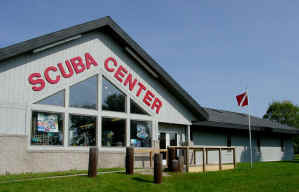 Scuba Center was established in 1973. Several decades of experience puts us in a position to have established relationships with manufacturers and distributors of many of the finest diving and related marine products in the world. Our staff includes Commercial Divers, Public Safety Divers, and diving professionals with a wide range of recreational, military, and technical diving experience. We were Minnesota's first PADI 5 Star Training Facility and have grown to become Minnesota's largest scuba diving school. We offer a complete range of scuba diving training classes from Beginning (Open Water Diver) to the PADI (IDC) Instructor Development Course. Scuba Center has a huge selection of quality scuba diving and snorkeling equipment, wetsuits, drysuits, and accessories. We feature equipment from the best manufacturers, at great prices. Scuba Center is an authorized dealer for all the products we sell. We order directly from the manufacturer / distributor of the items to give you the best quality and service. When you purchase your equipment from us, you will be receiving the Full Manufacturers Warranty. Our Eagan Scuba Center, located just 5 minutes south of the Mall of America, features a 12 ft deep in store pool heated to a tropical 88 degrees, two classrooms, a full line of scuba diving & snorkeling equipment, Technical Diving gear, Nitrox fills, and our Public Safety Department. 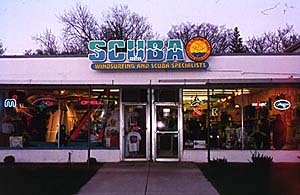 Our original Scuba Center in south Minneapolis, open since 1973, offers a complete selection of scuba diving equipment, snorkeling equipment, and lessons. The location, just two blocks south of Lake Harriet, is perfect to be your Standup Paddleboard headquarters.